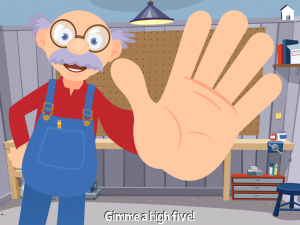 Grandpa’s Workshop Review – Gramps is in the clubhouse! Ever wonder what grandparents do all day, given all the free time that comes with retirement? In between cross-country RV trips, this silver-haired Gramps is tinkering in his tool shed. We’ve already visited his lovely wife Grandma in her garden, so now we’re off across the back yard to see what Grandpa is up to. 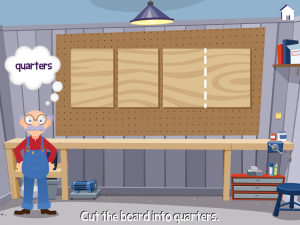 Grandpa’s Workshop is a learning app that covers a range of skills perfect for the 2-6 crowd. 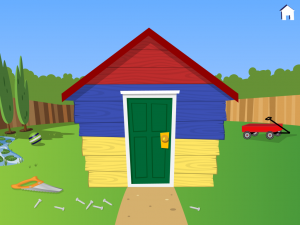 Seven different mini-games include painting wooden furniture to help with learning colors, helping Grandpa with projects by counting screws and bolts, and measuring out pieces of wood with a ruler. There are also real instructional videos, short blurbs about different carpentry methods and using real tools. For wrong answers, Ol’ Gramps words the instructions differently so that kiddos can approach the challenge from another angle. Correct answers are rewarded with a creaky jig or a high-five. After a handful of rounds playing the mini-games, Grandpa offers us the components to help build our own clubhouse, with the end goal being a completed project. Both of my kids equally enjoyed playing this app, proving that both the entertainment and educational contents appeal to a range of ages. The app is well-executed and makes fun times out of basic learning for the pre-school players. We did, however, get a little frustrated with one of the mini-games. Grandpa asked us to saw boards of wood into different sections to help teach us about fractions. Unfortunately the rubbing action required to separate the boards was a little tricky for small hands. While the board looked like it was successfully cut the game wouldn’t continue without some extra, unnecessary sawing. It was a minor issue and once we learned the proper technique it wasn’t a problem. Grandpa is just as endearing, fun, and educational as his lovely wife and her green thumb. Make sure to grab this app now while it’s at a reduced download price of $0.99. Basic and simple, perfect for even the earliest of learners. One Response to Grandpa’s Workshop Review – Gramps is in the clubhouse!